Well, it's Monday, and you may find yourself not quite ready to start your work day yet. Of course this is no Cyber Monday, but that doesn't mean you can't do a little online shopping. 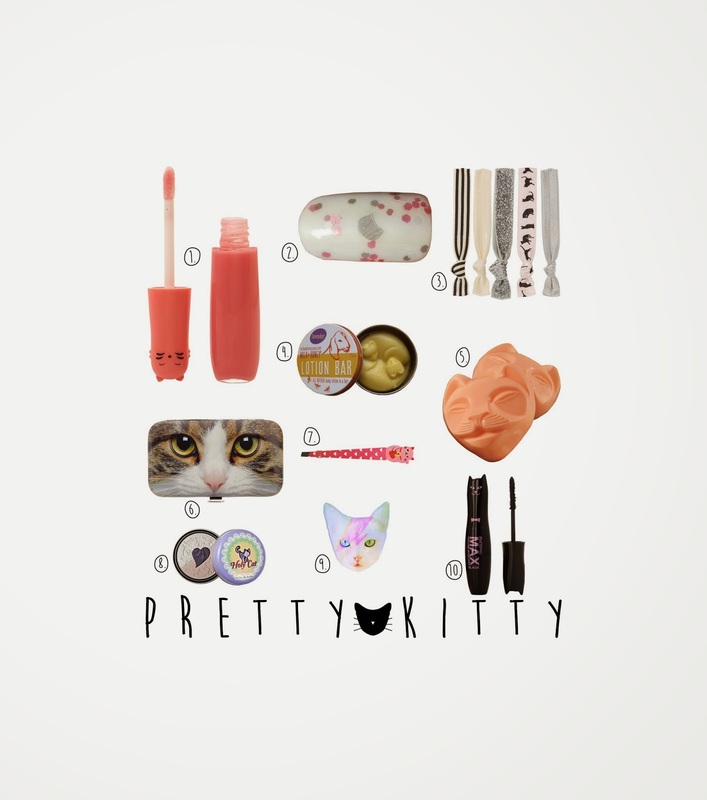 Today's theme is kitten-inspired bath and beauty products, and I've put together a collage above and a list below! Perfect for a spinster to keep in her purse and pull out for a little spinsterly touch-up. With this home made easy nail polish, you're sure to be the only one with your manicure. It even has little cat-shaped glitter pieces! Great for doing Cat Pose at yoga class. Perfect for a little late-night foot moisturizing if you're a hot-footed spinster like me. OR you could carry this tin in your purse and lotion up on the go! Just because you love kittens doesn't mean you have to bathe like one. Use some soap! This cat soap is great for bath time or just for your spinsterly guest room. Us this with your cat glitter nail polish and have the perfect peticure. Pun intended. Just because you're a spinster doesn't mean you need to have a unibrow. To ensure that gets taken care of, use cat tweezers as an incentive. Use this for all the shading before you pencil in that excellent cat eye with your eye liner. Try this out for a little while before you get the real thing. You may decide you don't want it on your forehead...Or maybe you'll decide that you want it on your cheek instead. What's a cat eye without some fabulous kitty mascara? So, now that you're all clean and pretty, you can proceed with your week. I once heard it said that online shopping gives you a reason to go on for the next few days, so I hope you ordered something. That way you can at least make it to wednesday.